He who dies with the most toys wins. But he also dies. Blu-rays, action figures, lunch boxes, posters; what’s your vice? On this episode, we debate the important issues about our personal collections. Joining us from the My Bleeding Ears podcast is our special guest Larry Watanabe!! 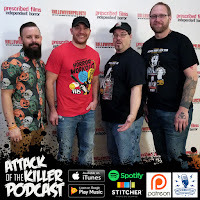 Attack of the Killer Podcast is a group of friends who love to talk shop about horror movies, the genre they all love and work in. Join Insane Mike Saunders and Jason Bolinger (of independent film company Prescribed Films), Tadd Good (Director of the Snake Alley Festival of Film), and Andy Wassom (screenwriter) as they discuss several horror films within a specific topic each episode. The candid conversation is fun, sometimes informative, often unexpected, and always from the heart. If you’re looking for some new friends, then this horror podcast is for you!